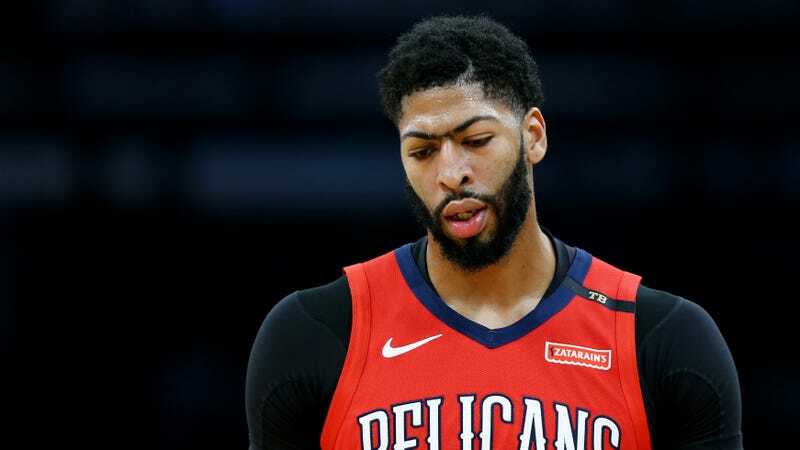 NBC Sports’ NBA insider Tom Haberstroh makes the case that the Pelicans have failed Anthony Davis and seems to imply that the organization’s chances of bringing back the generational talent have grown rather slim. While he goes through a bunch of factors that show just how mediocre the franchise has been over the years, a significant culprit behind the Pelicans failing Davis seems to be how the team has dealt with injuries. The numbers behind New Orleans’ history of injuries are jarring in their own right, but the potential reason for why they have been such a consistent problem is downright laughable. Last season, the Pelicans suffered the most player games lost due to injury, per an InStreetClothes.com analysis, costing the team nearly $30 million in lost salary. The season before that, they ranked third-last in games lost due to injury. The season before that, they ranked dead-last again. Over the last five seasons, the Pelicans have lost the second-most games due to injury or illness. Only the Sixers have fared worse over the last five seasons, which has been well-chronicled. This pattern isn’t a total anomaly if you ask rival team executives, who have long chided the Pelicans’ medical team for being run by “football guys” instead of those who have experience in the NBA. Fair or not, the Pelicans are fighting against a league-wide perception. The collection of staff members only hired on the basis of their football experience is kind of wild. The team’s head trainer hired in 2010 came from the Texans, and his successor was an assistant trainer for the Saints. In 2012, the team hired Mickey Loomis to be president of basketball operations for the Pelicans while also being general manager of the Saints. The organization even kept on Dr. Misty Suri, a Saints orthopedist who was fired in 2017 after misdiagnosing cornerback Delvin Breaux’s broken leg, as Director of Medical Services and Head Team Physician. Even more eye-opening is the injury list that’s followed these hiring practices to the training and medical staff. Tyreke Evans, Quincy Pondexter, Frank Jackson and Alexis Ajinca are all New Orleans players who have had to go through multiple surgeries over a short period of time. Eric Gordon had to go to the media himself and set his timetable to return from injury in 2012. Then, there’s DeMarcus Cousins, the first true superstar to play with Davis, whose tenure with the Pelicans was wasted because of terrible minutes management. Forget the (unfair) label as “injury-prone” throughout his career—if you’re Anthony Davis, why would you stick around with a team that not only can’t keep anyone who could help during a championship run healthy, but also has owners who couldn’t be bothered to hire the right people to protect those players in the first place? The Benson family probably thought they were smart to cut costs while owning two professional sports teams by committing to these “crossover” hires. But, like every half-baked idea from bumbling rich airheads, it backfired. Sure, the Bensons will definitely be saving plenty of money pretty soon, but only because their most expensive asset likely won’t be there.